The countdown has begun... Nicole Pascal, a preservationist of Ancient Art at the Louvre Museum and presenter of a television program on archaeology, is contracted as an expert to investigate the discovery of some surprisingly well-preserved Mayan remains. During her research, Nicole finds revealing inscriptions that offer clues to one of the most evocative Mayan treasures: the jade mask. According to legend, the mask contains the wisdom of the Mayan civilization and will only be returned to the hands of men when the gods decide that the right moment has come. The countdown has begun. A complicated calculation with the Mayan calendar will determine the date of the end of the world. 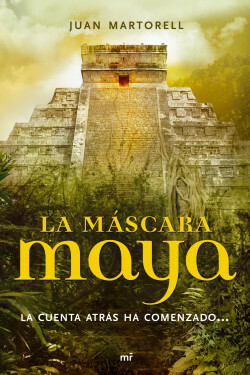 A fascinating novel which gives witness to the splendour and magic of the Mayan culture and will grip the reader from the very first page. The vibrant plot involves ancient traditions, shamans, princes, potions that turn men into animals... and much more. Presses de la Cité (France), Bookclub “Family Leisure Club” - Bertelsmann- (Ukraine).